Climbed: December 11 and December 13, 2011. 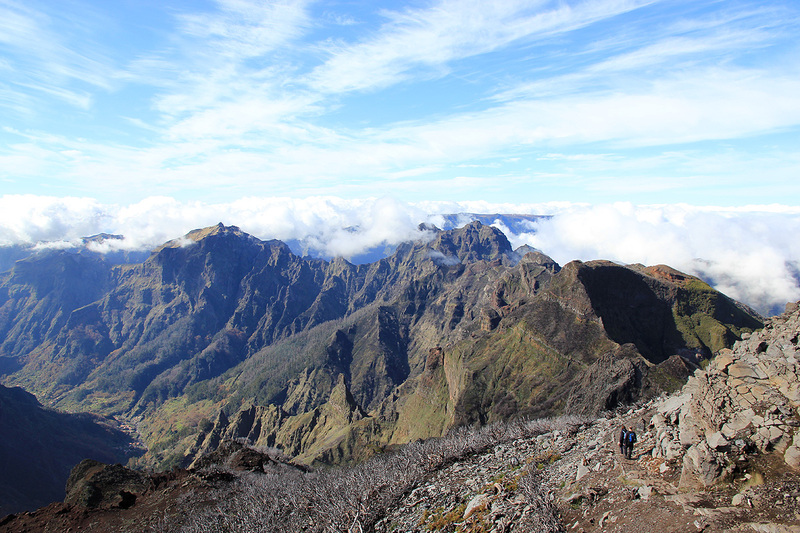 Here is an overview of peaks climbed on Madeira. 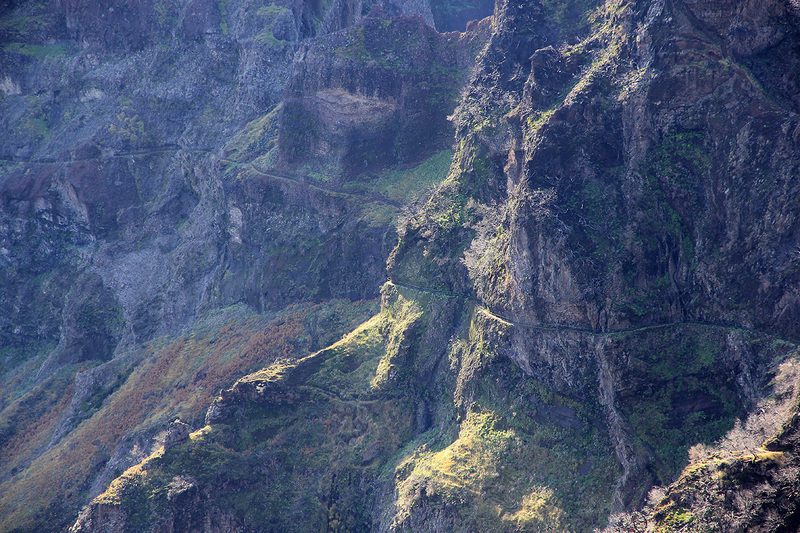 The road that serves the closest trailhead, originates in the village of Santana. In order to get there from Funchal, the fastest route is to drive the freeway back to the airport, then follow signs for Santana. Close to Santana, you will first enter a pretty long tunnel, then two smaller ones right thereafter. Drive uphill and slightly left from this exit. If you pass a theme park on your right hand side, then you are on the right track. Your goal is to locate an intersection with signs (going right) saying Pico das Pedras as well as a sign saying Pico Ruivo, 1861 meter. These signs are at location N32:48.131, W016:52.764, elevation about 465 meter. Follow this road uphill, there is a sign higher up saying Pico das Pedras (but not Ruivo), this is still the correct way. If you want to do a minimum of 600 vertical meter gain, then park on the right hand side in a sharp left curve. This location is N32:46.139, W016:54.671, elevation about 1250 meter. 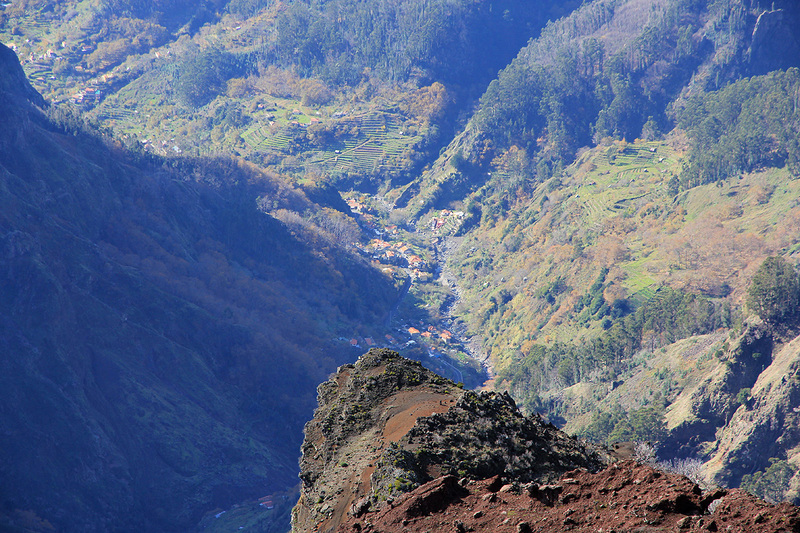 Otherwise, continue to drive until the road ends in a large parking area called Achada do Teixeira. This location is N32:45.897, W016:55.263, elevation about 1580 meter. 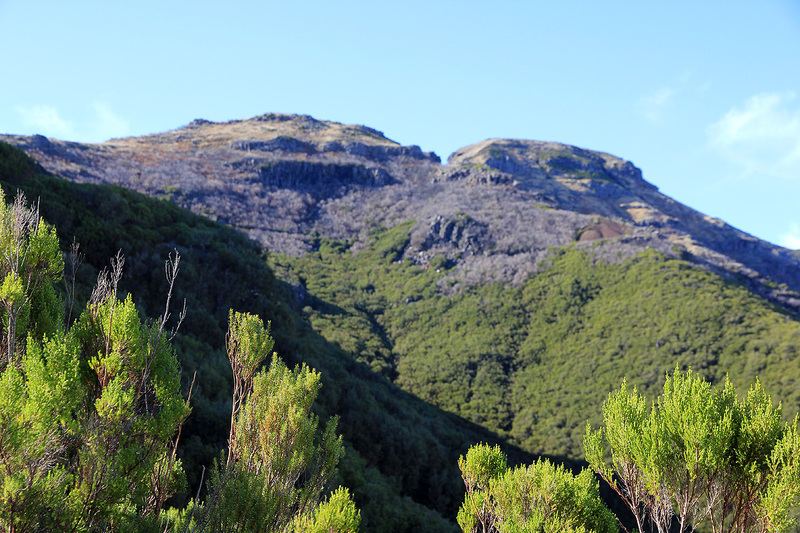 While hiking the road, you see some mountains off to your right, this is not Pico Ruivo, but rather terrain that you will cross in order to climb the mountain. 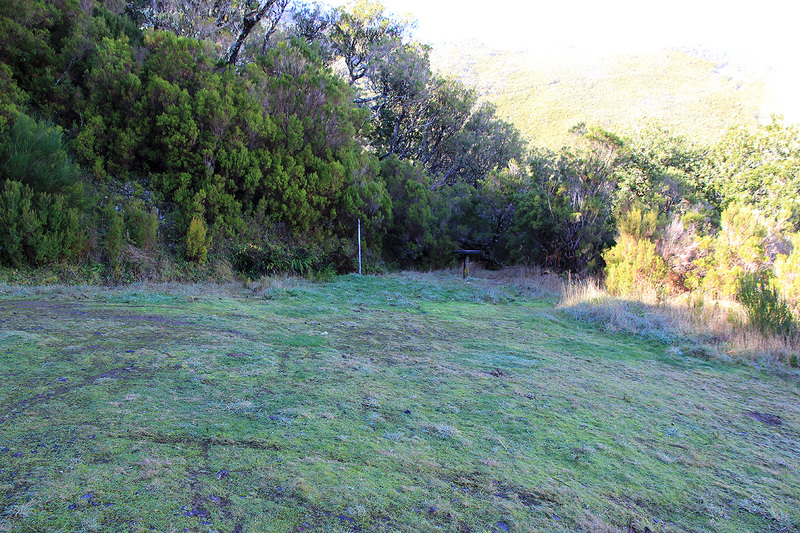 From the parking area, a well signed trail starts up the first gentle hill. This trail has been improved by carefully placed (flat) rocks all kept in place by mortar. 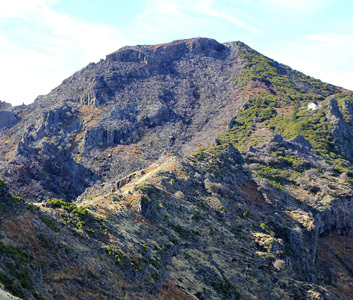 As soon as you reach the main ridge, the view (left) west displays very rugged terrain. The trail climbs the first hill, then traverses on the right (north) of peak 1789 before crossing its saddle (looking back) and ascending to the local mountain hut. 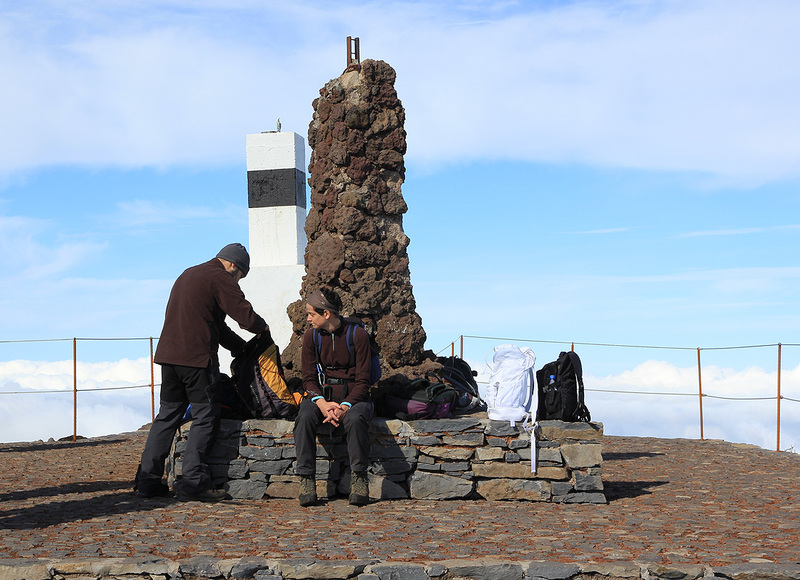 Just before this hut, the more famous trail from Pico Arieiro merges in from the left side. For a description of this route, see Pico Cidrao. The view of the very steep Torres captures your attention. From the hut, the trail first reaches a junction where the longer route to the col Encumeada continues straight. Turn sharply left here and complete the short climb to the summit. I decided to honor my 600 meter vertical gain criteria, thus parked at elevation 1250 meter. I left at 1100 and reached the official trailhead (big parking area) at 1130. From here, it took me another 45 minutes of leisurely walking to reach the top at 1215. There were several German tourists also making the hike. 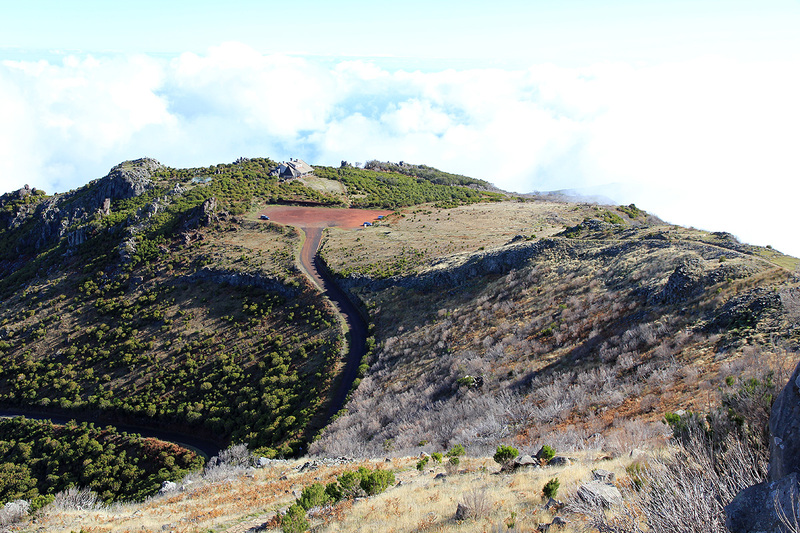 From here, the view was nice directly across to the radar station at Pico Arieiro. Descending, I bumped into a couple from Haugesund at the mountain hut. I continued back down to my car, arriving there at 1330. 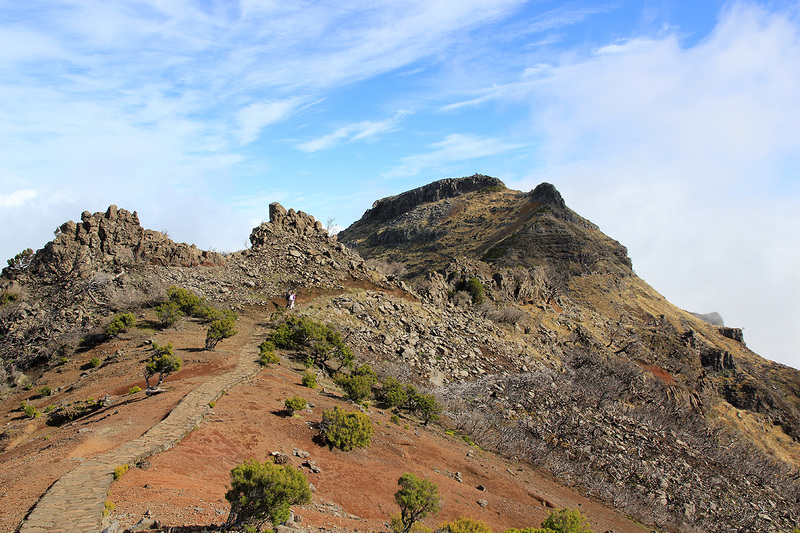 Two days later, I repeated this climb with my wife Heidi, but then along the much more famous route from Arieiro, see Pico Cidrao. for a description of this interesting route. 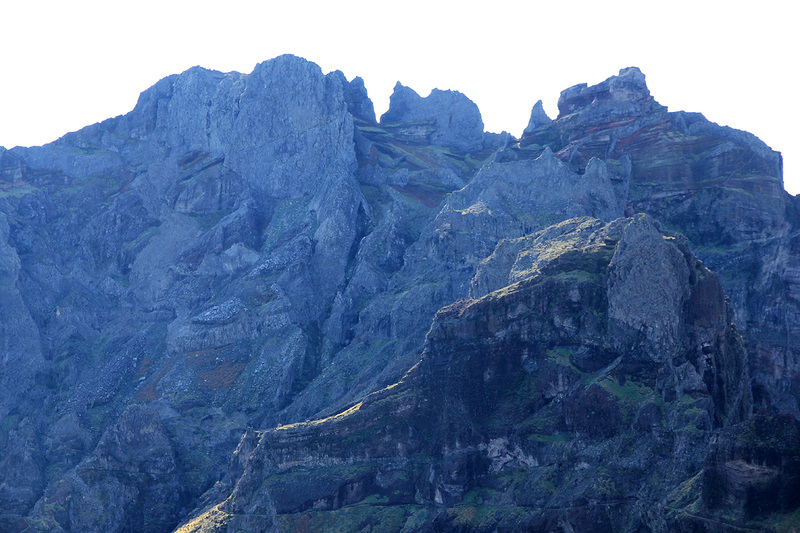 Torres, as seen from the early part of the hike. The route, as seen from the summit. Follow the ridge, then traverse the left side of the subsidiary peak in this picture. 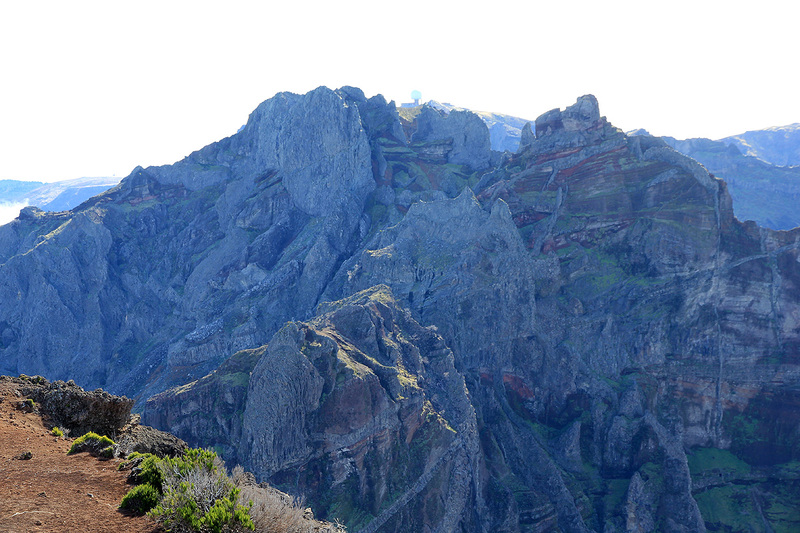 Summit view, upper part of the hidden valley, Curral das Freiras. 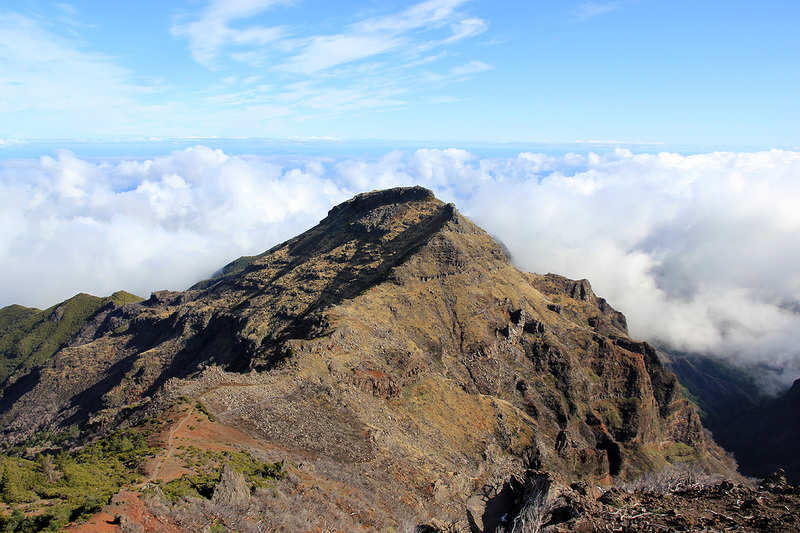 Summit view, across to Pico Grande. 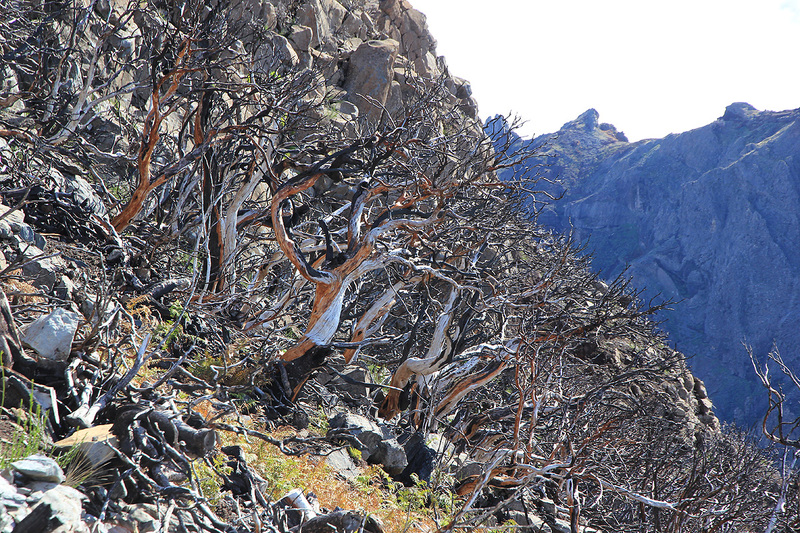 Trees, just below the summit of Pico Ruivo.